The Velo Champion Multifunction Bike Tool is the Swiss Army Knife of bike multitools, both in terms of design and amazing functionality. The Velo Champion is equipped with enough tools for a cycling enthusiast to disassemble and reassemble without taking it to a shop or using any type of tool on the side. With 18 of the most important tools you may need to repair your bike, this bike tool is surprisingly small and light, measuring 85 mm x 40 mm x 15 mm and weighing just 200 grams. 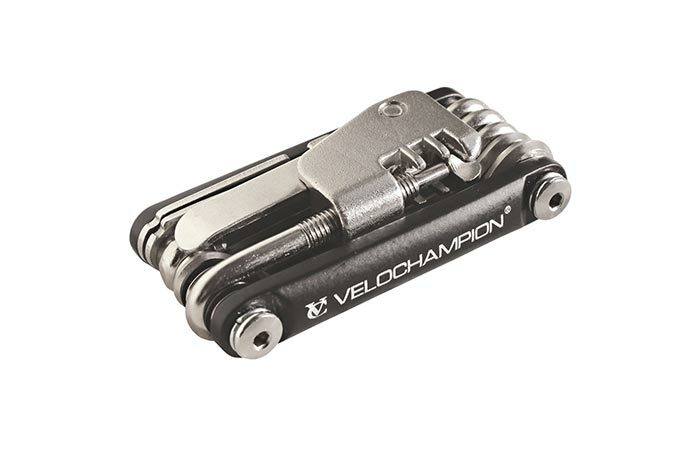 The Velo Champion’s tools include hex wrenches of six sizes (2, 2.5, 3, 4, 5, 6, 8 mm), a Philips and a Flathead screwdriver, a Torque T-25 wrench and two tire levers. 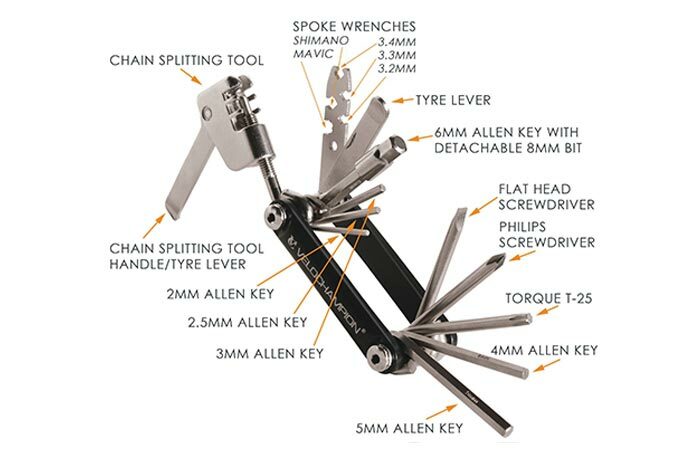 With these five tool types alone you can do a lot of work, but the most amazing addition to this bike multi-tool is the chain splitting tool, which every recreational cyclist will be glad to have available at all times. The Velo Champion also comes with a spoke wrench tool, and we’ve decided to mention it separately to inform you better about its compatibility with spoke sizes. This spoke wrench supports spoke sizes from 3.2 and 3.3 to 3.4 mm, and it has Mavic and Shimano specific spoke wrenches. So, if the sizes supported by this wrench don’t suit you, well, you still have a bunch of other tools you can put to good use. 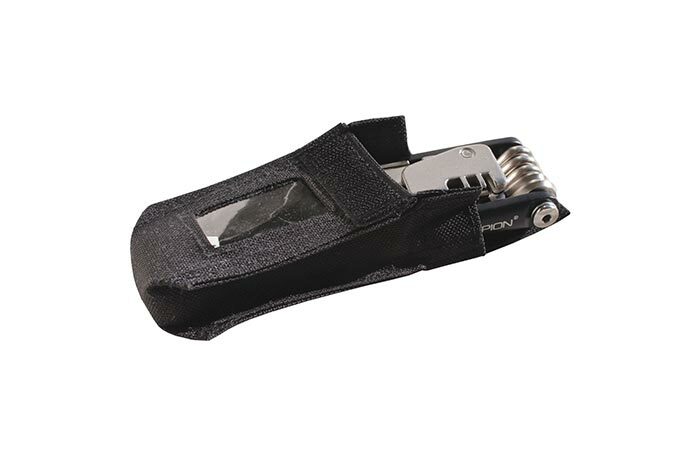 This entire bike tool comes in a durable nylon carry pouch which can be easily stored in a saddlebag or your backpack due to the small size of the actual tool. This bike tool is perfect for all cyclists who don’t want to leave anything to chance and want to be prepared for any malfunction on the road.